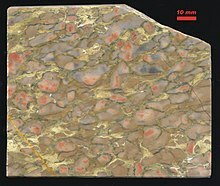 In sedimentology and geology, nodular is used to describe a sediment or sedimentary rock composed of scattered to loosely packed nodules in matrix of like or unlike character. It is also used to describe mineral aggregates that occur in the form of nodules, e.g. colloform mineral aggregate with a bulbed surface. Nodule is also used for widely scattered concretionary lumps of manganese, cobalt, iron, and nickel found on the floors of the world's oceans. This is especially true of manganese nodules. Manganese and phosphorite nodules form on the seafloor and are syndepositional in origin. Thus, technically speaking, they are concretions instead of nodules. 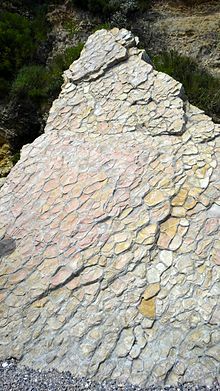 Chert and flint nodules are often found in beds of limestone and chalk. They form from the redeposition of amorphous silica arising from the dissolution of siliceous spicules of sponges, or debris from radiolaria and the postdepositional replacement of either the enclosing limestone or chalk by this silica.